HTC One X and Sony Xperia S the two recently launched smartphones in India currently buzzing the market. Both of these smartphones were launched at MWC 2012. HTC One X has Quad-core processor running on Android 4.0 Ice Cream Sandwich while Sony Xperia S has Dual-core processor and runs on Android 2.3 Gingerbread( Will soon be upgraded to ICS in Q2). HTC One X is really advance phone as compare to Sony Xperia S but the price is the biggest factor for people. HTC One X is costly phone because of its high specs while Xperia S is cheaper than One X. I pitch them against each other to see which Smartphone is best for you. Processor decide the price, speed of the smartphone. HTC One X is powered by 1.5 GHz Tegra 4 Quad-Core processor, 12 GeForce GPU cores where Xperia S is powered by 1.5 GHz Qualcomm MSM8260 Dual Core, Adreno 220 GPU cores. Quad-Core is quite powerful processor when its compared to Dual-core processor. HTC One X and Xperia S comes with 1 GB of RAM and 32 GB of Storage. Both phones lack microSD card slot but One X has 25GB of Cloud storage. Sense 4.0 is integrated with Dropbox to get the maximum from Dropbox, all these you can’t achieve in Xperia S by installing Dropbox apps. Cloud Storage play very important role in smartphones, as you can use cloud storage as external storage to store you files, photos, and videos and can be accessed to any where. Even if you lost your phone, your files are safe on cloud storage. 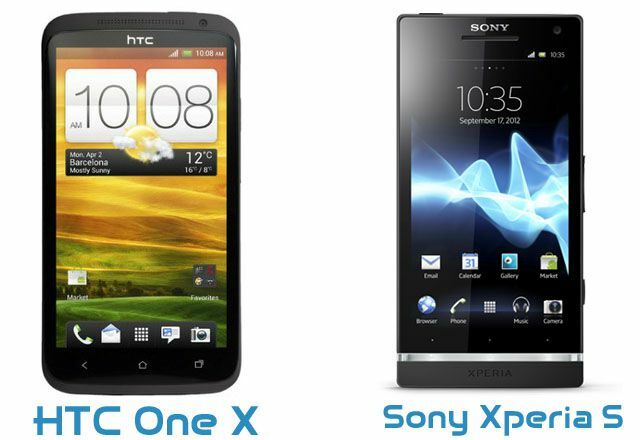 One X has 4.7-inch Super LCD2 touch screen with 720 x 1280 resolution and 312 ppi pixel density while Xperia S has 4.3-inch LED-backlit LCD capacitive touchscreen with 720 x 1280 pixel and 342 ppi pixel density. The 2.5D Corning Gorilla Glass which comes with One X and Scratch-resistant glass which comes with Xperia S capable to protect the screen from external damage but Corning Gorilla Glass is slightly better than Scratch-resistant glass. Both phone has almost same display (One X has slightly bigger) with same features. Operating System play major role in smartphone market, One X comes with Android latest flavor Android 4.0 Ice Cream Sandwich OS where Xperia S comes with Android 2.3 Gingerbread OS. Xperia S will soon be upgraded to Android 4.0 ICS but in current market One X wins the fight as it has latest Android OS plus HTC Sense 4.0 UI which is incredible great. On the other side Xperia S comes with Timescape UI. Xperia S will be upgraded to ICS in Q2 of 2012 but here UI play important role, Sense 4.0 UI is very powerful and visually rich. Sense 4.0 is integrated with Beats Audio and Dropbox Cloud Storage. This is the tough category and both phone have powerful camera. One X has 8 MP camera with autofocus and Smart LED Flash capable to record 1080p HD Videos where Xperia S has 12 MP camera with Auto focus and LED flash capable to record 1080p HD video. Resolution wise, HTC One X camera is average for high end smartphone, on the other side Xperia S did well in camera department. But One X Image sense makes the camera bit more fruitful than Xperia S.
If we talk about the feature, One X has BSI sensor for better low-light captures, F2.0 aperture and 28 mm lens, Dedicated imaging chip, capture a photo in the midst of recording HD video, 0.7 second shutter time and video stabilization. Xperia S has really good features like Sony Exmor R for mobile CMOS sensor, 16x digital zoom, f/2.4 aperture, 3D Sweep panorama, Face recognition and Smile shutter. Like just about every other smartphone out there, the HTC One X and the Sony Xperia S both come with a separate front facing camera which can be used self portrait photos and videos, as well as used for HD video calls. Both phone has 1.3 MP front facing camera and can record 720p video. Both smartphone HTC One X and Sony Xperia S have good camera in their own right and its bit difficult to just image quality with naked eyes. Battery is always biggest concern in smartphone. People struggling to get more battery backup. HTC One X comes with 1800 mAh pack while Xperia S comes with 1750 mAh pack. Not much difference in battery power but don’t forget that One X runs on Quad-core which eat more battery than dual-core. HTC already facing criticisms but latest software update improve the batter life. On the other side Xperia S has good battery life with 450h of standby time and 7 h 30 mins of talk time. HTC One X or Sony Xperia S Which Phone you should buy? Both phone is good in its own rights. HTC One X is powerful phone with authenticated camera and sound, running on latest Android flavor Android 4.0 ICS. Sony Xperia S is less powerful as compared to One X but has awesome camera and battery life. If you’re looking for next generation phone with extremely fast device, authenticated sound/camera and want to taste latest Android OS flavor than HTC One X is for you. If you’re looking for smartphone with good camera, more battery life and decent price than Sony Xperia S is for you. You’ve to wait till Q2 when Sony release the ICS update for your phone. it’s good enough for knowledge. Htc one is amazing……….Nice sharing………….. The Xperia S successor Sony Xperia Z will coming soon. This new smartphone really excited. i love htc phones and nice reviews raza. the two phones are very nice phones butr the HTC one Xit very incredible phone as compare to sony xperia S.the main part of these phone is the camera,the camera of these these phones are too goood.but the price is the most important factor.nice i choose both phones. THis is a one sided review . not fair ! Yup, Actually Sony Xperia S will compete with Galaxy Note & SGS2.